Design resources never stop reminding us how important it is to be consistent when creating any graphic piece. We don’t argue. But as an eLearning designer, you know how challenging it is to walk the talk when it comes to maintaining a consistent look-and-feel throughout the course. After all, we are creative folks and artists at heart. Our brains get weary and scream for some zing by the time we get through a couple of slides. Brings an intuitive feel: Visual consistency helps learners make sense of how a course works—how to find their way around, where to look for instructional and navigational elements, and what to make of the various visual elements. 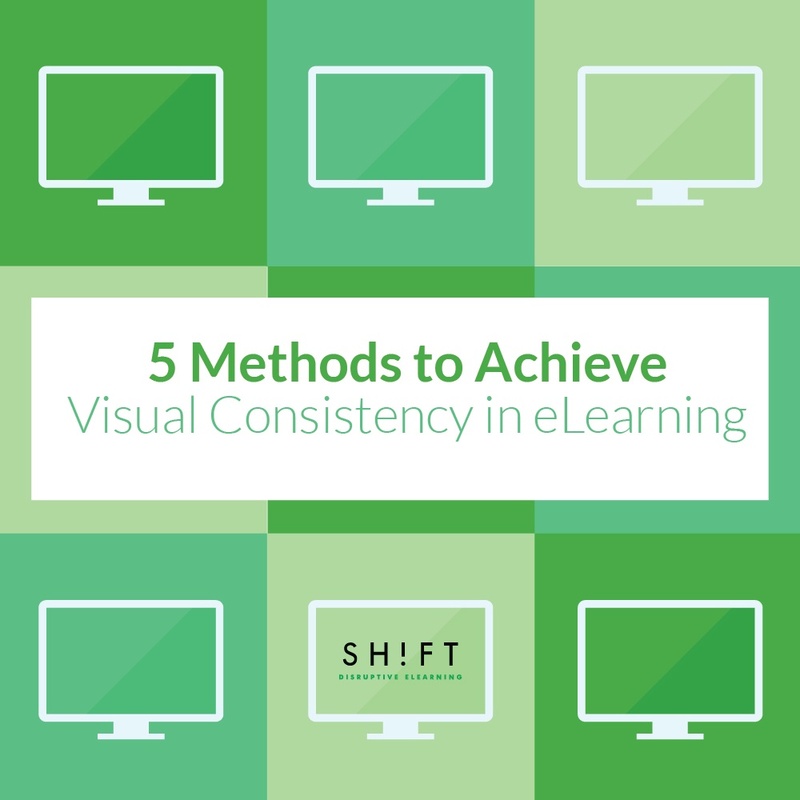 Consistency lends familiarity to the interface, so learners feel confident using it. Familiarity is comforting! Reduces cognitive load: Consistency reduces the cognitive load of a course by making it easier for the learner to move ahead with the learning instead of wasting mental energy trying to figure out how to perform an activity or access the glossary. Exhibits professionalism: A jumble of typefaces, an assortment of icons, and elements placed haphazardly on the screen give your course a sloppy look. The “mess” reeks of unprofessionalism and laziness. Creates harmony: There is beauty in balance. When the visual elements are designed to look and function consistently, there is also a sense of cohesiveness. Do you remember our article on Visual Hierarchy? Here’s the link in case you want to look it up. Chunk content to decide the order of importance in which they should appear. Organize groups of content to create a logical and predictable sequence. Determine font sizes for different levels of content—headline, sub-heading, and body. Determine the placement of the various visual elements—text, images, and buttons that reveal layered information—about one another, so the eyes can naturally read through the content in their right order of priority. For instance, the button that on clicking opens a piece of nice-to-know information is placed after the primary content and near the bottom of the slide. A consistent color scheme not only creates visual symmetry but also aids usability. It facilitates learning by delineating the viewing order of the many objects on the screen and distinguishing between functionally dissimilar elements. Choose a color scheme that has 1-3 primary colors and 1-3 secondary colors. This ensures there is variety in the course. Choose colors that are contrasting but complement each other. This ensures the color palette is not jarring to the eye. Learn about the Color Wheel here. Keep in mind the psychology of color when choosing colors for your palette. You can create diversity by using different shades of the same color or by adjusting brightness and contrast. Use consistent colors for related elements. Don’t sacrifice visibility for the sake of using colors. Make sure that your colored backgrounds don’t make text illegible. 3) Repeat visual elements to enhance usability. Icons: Icons represent complex ideas and broad themes within a limited space and make for ready recognition. Icons like email or print don’t need to be explained. But make sure that you flesh out the theme of your course or the overarching story or scenario somewhere in the beginning that will explain the icon you will use later on. For instance, if your scenario is about climate change, you can use an illustrated icon of the earth that learners can click to re-read the scenario. It is also a good idea to place this icon on the page where you flesh out the scenario to aid association, recognition, and recall. Typefaces: Do not use too many typefaces. It is a good idea to choose a typeface or font family with many styles that will let you create different looks with the text without sacrificing consistency. Buttons and Tabs: Do not change styles. Your buttons and tabs may have different colors, but they should look like they belong to the same course. For instance, if you use an embossed style, stick to it throughout the course. Also, make sure that buttons or tabs that have similar functions should resemble each other. Navigational tools: Navigational tools should ideally look similar and be positioned at the same place across the course. The hallmark of an effective navigational structure is that it makes it easy and intuitive for learners to make their way around the course. Don’t experiment with navigational buttons; if your learners can’t recognize a new-look Next button and thus cannot advance to the next slide, your course fails its purpose. 4) Be inconsistent at times. You can introduce an element of surprise to spice things up a bit without sacrificing the harmonious look of your eLearning course. Some inconsistency once in a while will add a point of interest in your otherwise consistent course. Inconsistency is like that one piece of snazzy accessory that livens up simple attires and prevents it from becoming boring. The key is to strike a balance, and the rule of thumb is: be inconsistent in moderation and to serve a purpose, NOT just because you want to have fun. Else you will end up with an eLearning course that is chaotic in appearance and confusing to make sense of. To draw attention: What is out of the ordinary catches our eyes instantly and keeps us hooked. Be inconsistent to stand out and draw attention to the most critical parts of the material in a slide. You can use a pop of color, a different typeface or layout, or a unique icon to make learners pay attention. To distinguish among the various elements: Just as similar items should look like one another, disparate elements should look different too. Don’t be so hung up on the consistency that the navigational buttons in your course look like buttons that reveal layered information. Or don’t be so consistent that the drag-and-drop activities in your course look no different than a static table that presents information. To maintain usability: If consistency gets in the way of usability, then break away from the pattern and be inconsistent. For instance, if an image related to the material does not stand out from the rest of the screen, consider breaking away from the color scheme and using a different palette for this slide. 5) Create a style guide. This may not sound as important as creating a strong visual hierarchy or sticking to one color scheme throughout the course, but a style guide keeps you aligned with the overarching visual theme. A style guide is very handy and serves as a ready reckoner when several designers work on one course or you have to create several courses as part of a series. Many eLearning designers like to create a style guide and share it with their clients before starting to develop the course. This gives clients an idea of how their course is going to look like and prevents rework later. Consistency is at the core of great (read: beautiful, intuitive, and effective) visual design. As an eLearning designer, you have a challenging task. You have to create visually attractive courses that engage and educate effortlessly. Be consistent to help your learners tide through complex learning matter. What are Personal Learning Networks?